In this article, you will find the current legislation for the use of drones in Belgium. Private use: This category includes all drones up to a take-off weight of 1 kilogram. In this category, the drone must not fly higher than 10 meters above ground. Use as a model airplane: Model airplanes with a mass of 1 kg to 150 kg may only start for private purposes on an official model airfield and have to maintain their flight altitudes. Class 2 drone flights: This class includes maneuvers with a maximum altitude of 45 meters (150 feet) outside of cities and towns and outside controlled airspace. Drones may weigh a maximum of 5 kilograms in this category and must always be controlled in direct view of the pilot. Class 1b drone flights: Class 1b drone flights may be held up to a height of 90 meters above ground outside the controlled airspace. For people and objects on the ground, a distance of 50 meters must be maintained. Class 1a drone flights: Class 1a drone flights may be held up to a height of 90 meters above ground outside the controlled airspace. In this class, persons may be flown over. Based on the planned maneuver, various regulations must be adhered to, which can be found in the table below. For the registration of a drone, this form is available. As a commercial pilot, you must complete a theory course and pass a practical flight test. Depending on the class of operation, you will receive a Certificate of Competence (class 2) or a Remote Pilot License (class 1b and 1a). In classes 2 and 1 drone insurance is required. But even with private drone use, we recommend corresponding coverage. For flights in class 1b and 1a, an operating manual and a risk analysis must also be prepared. Flights in these categories must be announced in advance to the BCAA. Performed flights must be documented in classes 2, 1b and 1a in a logbook. Distance to airports: You must be 1.5 nautical miles (2.8 km) away from airports and helicopter landing sites. 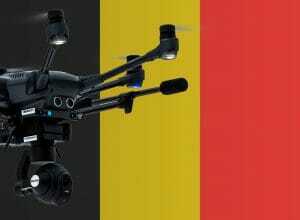 We have researched the listed drone regulations for Belgium to the best of our knowledge. We can not guarantee the correctness of the information. If you want to be on the safe side, please contact the competent aviation authority. Alternatively, you can also ask the embassy in your country for further information about the regulations. Please leave us a comment when you receive news and/or gain experience with your copter in Belgium! Hi! Please help me. I just want to know if i can fly in fpv my 500g quadcopter. I practice freestyle flights. aircraft terrain as specified in the Aeronautical Information Package (AIP). (330lbs) – must remain within line of sight at all times. line of sight at all times. All operations that are not covered under the previous categories are to be considered as Class 1a operations. Hi! Thanks for keeping us updated!